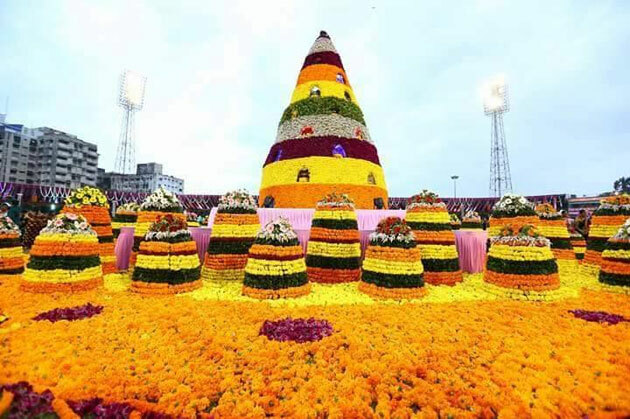 A new Guinness world record was created by the women folk of Telangana at the LB Stadium here on Saturday as they participated in the Maha Bathukamma. Singing and dancing to the tune of Bathukamma songs, 9,292 women went around the Maha Bathukamma at 5:12 p.m.
As they concluded the dance at 5:25 p.m. tourism secretary announced a new Guinness record after representatives of Guinness Record officially certified the event. The women formed 35 concentric circles around the 20-feet Maha Bathukamma and danced their way into the record books. They successfully bettered the earlier record held by women in Kerala where 5,211 of them danced to traditional songs on the occasion of Onam festival. The event on Saturday was jointly organised by the Telangana Tourism Department and the Greater Hyderabad Municipal Corporation (GHMC) besides several other departments. However, several days of planning and coordination by various government departments went into making the event a grand success. Star Attraction: The star attraction at the event was the presence Olympian PV Sindhu who participated in the dance. Scores of foreigners, dressed in traditional sarees, participated in the Maha Bathukamma. They were thrilled at the traditional dresses, the dances and the fact that so many women folk worked in unison to celebrate the event.